If the Pittsburgh Steelers want to make the postseason in any fashion in 2015, they can’t fall asleep at the wheel as they take on their ‘rust belt’ rivals tomorrow at Heinz Field as they play the 2-7 Cleveland Browns. Yes on paper the Browns are a complete and total mess. Coach Mike Pettine and GM Ray Famer look lost in terms of running a team, and there’s not many playmakers on this Browns roster. One reason NOT to take this team lightly though – even without talent and direction, the Browns play hard. They beat the Ravens in Baltimore earlier in the season, and trailed the Bengals in their last game by 4 before falling apart in the second half in their last game. With that, here’s our three keys to making sure the Steelers get out of Heinz Field with a win tomorrow, and our prediction for the game. 1. Dominate with the Run Game – If you haven’t noticed, the Browns run defense flat out stinks – as usual. The club is allowing 147 yards per game on the ground. If the Steelers offensive game plan doesn’t include DeAngelo Williams getting 25 carries, shame on them. The Steelers, even more so with Landry Jones, should make sure they focus in and use the run game to their advantage. With the Browns allowing huge chunks of yards on the ground, that shouldn’t be an issue. 2. Blitz Johnny – Johnny Manziel’s skill set includes the ability to get out of the pocket and make plays with his feet. One way the Steelers can stop that is run their variety of blitzes that him, and not letting him even get close to comfortable in tomorrow’s game. Manziel won his first start against a bad Titans team, but against the Bengals the Cincy D made halftime adjustments and shut down the Browns offense in the second half. The Steelers need to do that tomorrow, and if they play the chess game right, the Browns should score no more than 10-14 points. 3. Avoid the Mistakes that Loses Games to Bad Teams – Big turnovers that produce quick points, penalties in the red zone, those are the types of mistakes that kill good teams in games they should win. Mike Tomlin hopefully spent the week drilling his team that they have to be mentally focused and make sure they don’t do things that will allow the Browns to keep themselves in the game. A lot of it will be on Jones at QB to not throw bad picks, and also on both sides of the ball to not commit penalties that could cost the Steelers. If they play the game the right way, they should win. 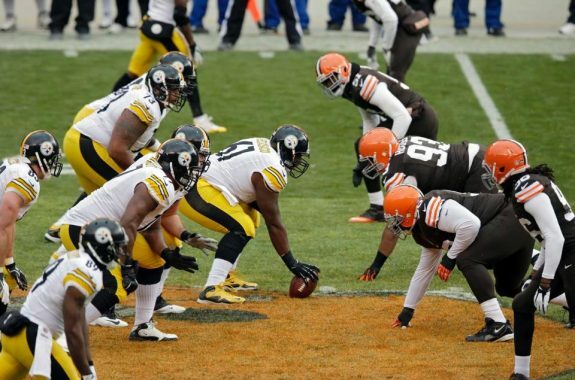 1 Comment on "Steelers Gab 2015 Week 10 NFL Preview – Cleveland at Pittsburgh"
Actually, Matt, your three keys — run the ball often, get to the QB on defense, and avoid mistakes — is a pretty good prescription for beating any NFL team. What changes from week to week is our ability to it. Under Mike Pettine, the Browns have improved considerably this year: the defense is solid and the offense needs only a few key players, including a consistent QB, to become playoff caliber. The Steelers should win this game, using the formula above and calling plays within L. Jones’s abilities. But the Browns would like nothing better than to beat their black and gold rivals, and our pass rush will be without J. Harrison. The Browns are not a team to be taken lightly, and the score is likely to be much closer than predicted above.